Tag Archives: Electricity through gas. “The job of commercialising in Australia is just too difficult” . . . 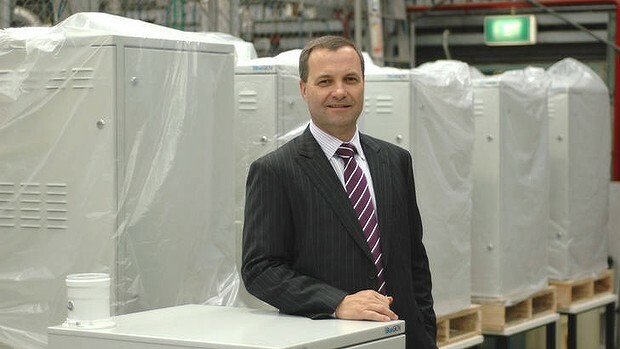 Ceramic Fuel Cells’ managing director, Brendan Dow. A high-tech energy company spun off from the CSIRO two decades ago says entrenched power companies and shifting government policy are forcing it to all but abandon Australia. Ceramic Fuel Cells, which makes small fuel cells that generate power and heat from gas or renewable energy, has shed 60 of its 110 Australian staff since July, and expects 98 per cent of its sales to come from overseas this year. The company will retain its research and development work at its headquarters in the Melbourne suburb of Noble Park but will shift most of its operations to Germany. “With the current conditions, the current support that we have, the current incumbent utilities, it means that the job of commercialising in Australia is just too difficult,” Ceramic Fuel Cells’ managing director, Brendan Dow, said. Known as BlueGen, the company’s product creates electricity and heat by passing natural gas over ceramic fuel cells. It comes as a box, about the size of a small washing machine, that sits next to a house or in a car park. The company claims it is 85 per cent efficient, and cuts the average home’s annual carbon dioxide emissions by 18 tonnes. Mr Dow said power consumers are at the mercy of the dominant power generators and retailers such as Origin, Energy Australia and AGL, which have little incentive to innovate or improve energy efficiency. Without bipartisan support for a sweeping overhaul of the industry, it was unlikely the federal government’s energy white paper, to be released next week, would make much difference, he said. “In a market that’s got powerful incumbents, a highly politicised area, it doesn’t make it easy,” Mr Dow said. That certainty includes financial support, with the company able to tap into a €250 million ($312 million) business development fund offered by Germany’s North Rhine-Westphalia state. One of its Blue-gen fuel cell retails for about $30,000 in Australia but as little as €10,000 in Europe, Mr Dow said. The company sold 40 of its units locally last year but the number may fall to as few as 10 this year. Generous feed-in tariffs mean an operator of the unit can generate about €2600 a year in Germany, more than twice the $1500 average return an Australian operator can expect, he said. The company expects to make its first annual profit in the next year or two, with sales now doubling every six months. Revenue in the year to June 30 totalled $6.7 million. The company plans to retain its domicile in Australia and its listing on the Australian stock exchange. BlueGen® delivers clean, controllable, on-site electricity for your home or business. About the size of a washing machine, BlueGen® connects directly to your natural gas supply, delivering low carbon electricity, 24 hours a day. It’s virtually silent, very efficient and reduces your carbon footprint significantly. BlueGen units are now available to showcase sites, green buildings, governments, local councils and other commercial customers. By sydney2020  Posted in Australian Life, Electricity	 Tagged Blue-gen, CSIRO, Electricity through gas.